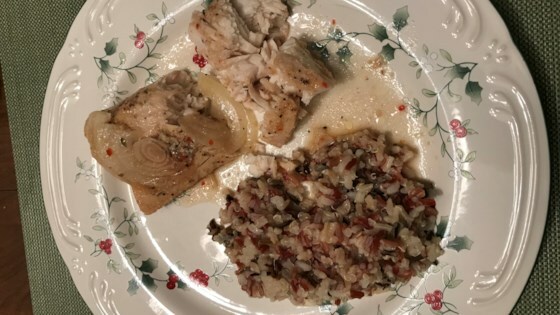 "It was my first time baking mahi mahi with lemon pepper seasoning, and it was delicious. The amount of seasoning used is optional and personal preference, as is the length of time you let it marinate." Arrange 4 large pieces of aluminum foil on a work surface. Place 1 mahi mahi fillet onto each aluminum foil piece. Pour Italian dressing over each fillet. Sprinkle each fillet with lemon-pepper seasoning and garlic powder; flip fillets and season other side with lemon-pepper seasoning and garlic powder. Place 1 onion ring atop each fillet and squeeze lemon quarter over each fillet. Fold aluminum foil over each fillet, crimping all the corners to completely seal. Place packets in a glass baking dish in the refrigerator to marinate, about 2 hours. Bake in the preheated oven until fish flakes easily with a fork, about 30 minutes. Carefully open packets and remove onion before serving. Make this healthy dish with your favorite wild salmon. The flavor of this fish was great BUT after almost an hour per directions in foil/325 oven, the fish were still cold. We finished then on the stovetop and the result was delicious. I like fish a lot including Mahi Mahi, but I expected a lot more from this recipe. Will not be making this one again. Could have used more flavor but it was very tender. I would make it again.